Are you looking for the best free WordPress theme in 2017? Of course, it will be responsive too. 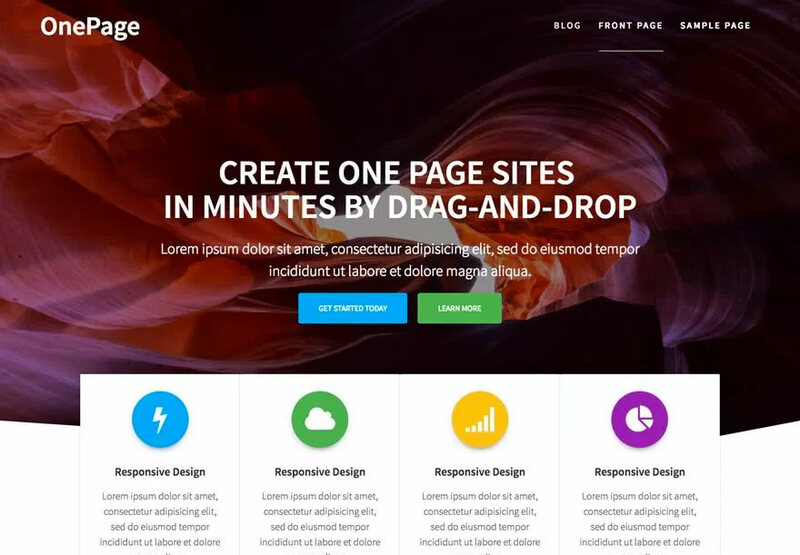 This post will describe 20+ best free responsive WordPress themes. All the themes are free and but it has a premium look. By considering the trends, it can be told as the most popular and top downloaded themes. Similarly, the themes are very user-friendly and well-coded. Let’s talk about the best free WordPress theme in 2017 as well as Responsive one. Business Zone is one of the best free WordPress theme in 2017. Trendy Theme, a popular Theme Developing Company is providing this awesome theme as free. By the way, it is premium quality WordPress theme. The name of the theme is describing its functionality. Really, you can use it for any kinds of business purposes. For example, insurance, consultancy, trading and much more about business. You can’t imagine a single free theme has included all of the important and essential parts into a theme. The most amazing part of this theme is its backend panel. It’s very strong but easy to customize. It has used King Composer. So, you can easily customize it by drag and drop. Similarly, the theme is very clean code and well optimized. Spacious is an another best free WordPress theme in 2017 by ThemeGrill. The theme will be best suited for portfolio, business, blogging and any other types of services. It offers 4-page layouts, 2-page templates. Similarly, it will also provide 4 blog display types, 13 widgets areas. On the other hand, 5 custom widgets area in this theme will be super interactive for building a multipurpose theme. Important to realize, it’s one of the popular and best rated WordPress web template. It allows you the primary color option and it will help you to match logo according to your company. You can choose their two color layout including wide and boxed layout. 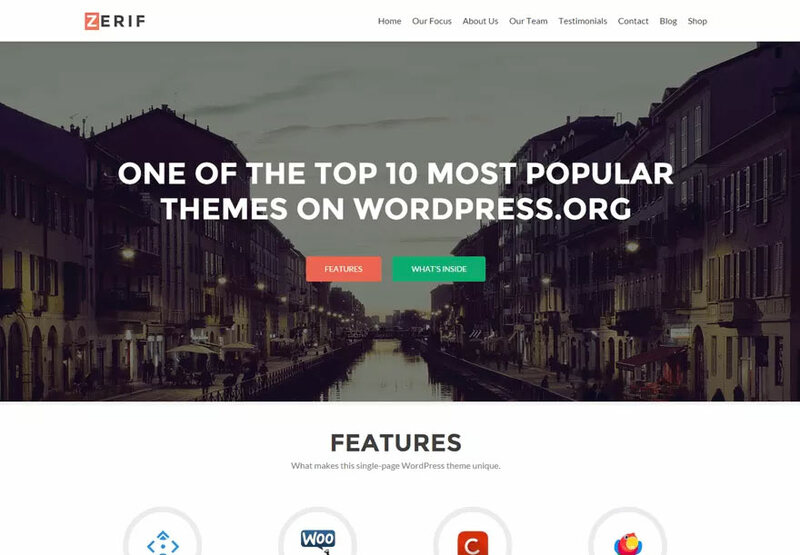 Zerif Lite has been built with bootstrap with parallax support and it’s the best free WordPress theme in 2017. The theme is very clean and well optimized. Similarly, it provides blogging layout as like post based websites. Though you can use it for the web agency, business, corporate business, personal blogging platform. 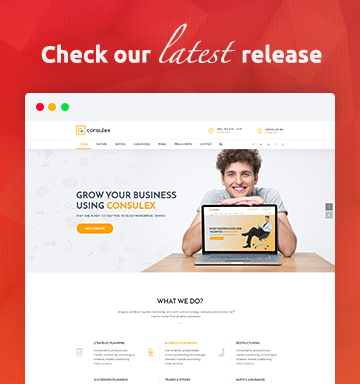 It is a flat and minimal WordPress theme with Woocommerce compatibility. It will support WPML, RTL, and Retina-Ready. Another key point, the theme is very SEO friendly. One page Express is the best free WordPress theme in 2017. It is a popular one page WordPress theme and you can create the theme within minutes. You can use custom featured images and logo in this theme. It offers 30 ready to use content sections with the special icon and it gives the whole websites a professional look. The theme allows you to add video background, slideshow background, header content types, etc. Similarly, it offers theme options where you easily customize the theme in the live session. On the other hand, it is a responsive WordPress theme, for this reason, it will work fine in all types of devices very fine. Important to realize, this amazing theme is translation ready. 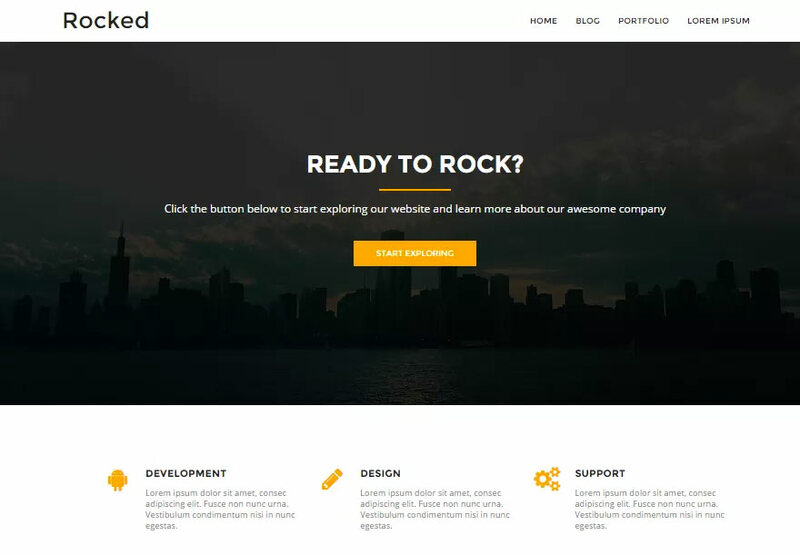 Rocked is a free premium quality WordPress theme. You can use it by downloading it very easily. It allows you to create corporate websites with full customization support within minutes. On the other hand, you can also use this free theme for your clients project or business purposes. You can easily choose if you want to make a page full width, blogging styles or anything custom. It has added plenty of color options with this theme which will give you to make it more professional. The theme will support Google font that means you have no limit to choose good fonts. Similarly, it offers blog options with a blogging style template. Not to mention, you will regularly update and fast support. Significantly, it will allow you to use this theme in any language and it is cross browser supported. 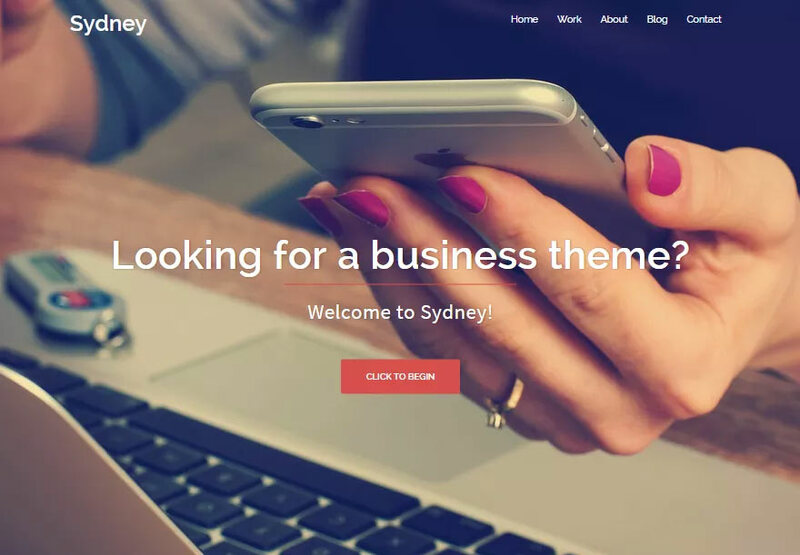 Sydney is an another best free WordPress theme in 2017. If you are freelancers or digital business owner, you can easily start your online presence by this awesome free WordPress theme. As a free theme Sydney is very popular and top-rated also. It allows you to access Google Fonts and full-color control among the website. If offers to upload your company logo and custom header image by default. You will get sticky navigation menu and full-screen slider with the template. 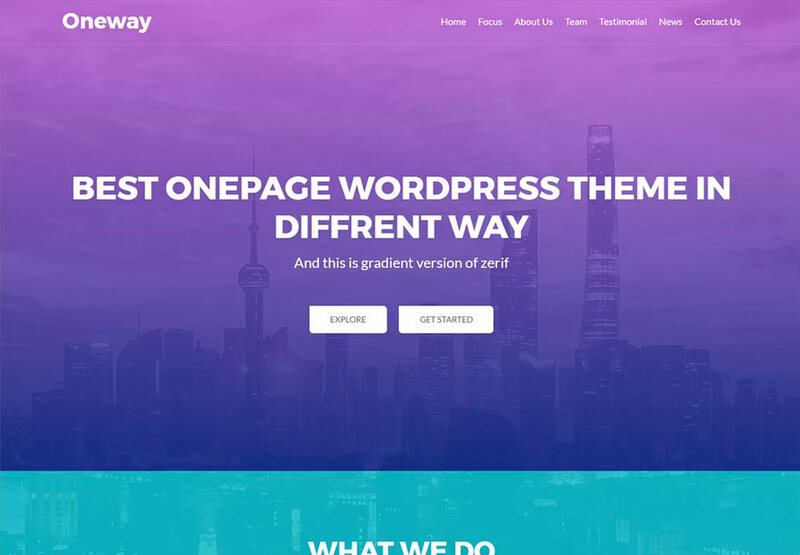 One Way is a free WordPress theme and it is the best child theme of zerif lite. The theme is very perfect for Agency, Personnel, Local business, Corporate etc. Another key point, in this theme you will find all the opportunities of Zerif lite. It offers different section alongside gradient overlay. The theme also offers custom menu and amazing theme options to customize it with your choice. Though the theme is very new in the WordPress directory, you can use it for an interactive website. 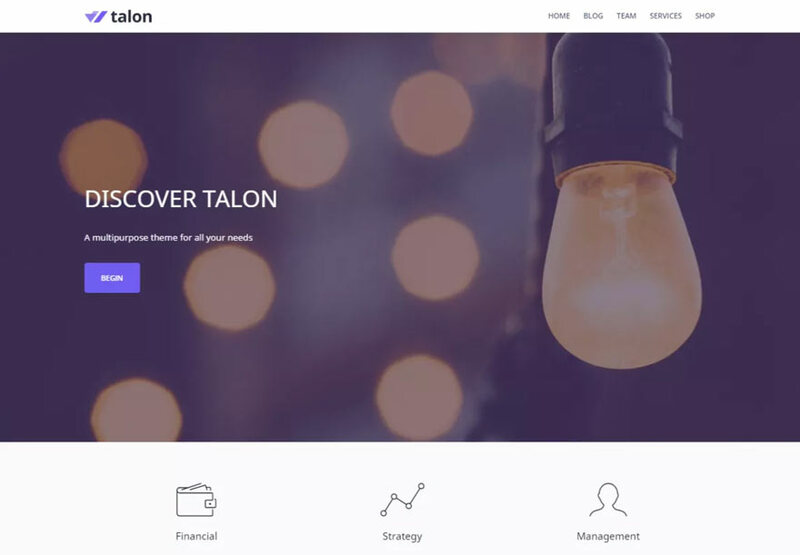 Talon is a free multipurpose WordPress theme and it will be best suited for any types of business. It has used the latest technology to build the theme. It can be used both freelancers and companies. It’s a full-width template with right sidebar. Similarly, if offers custom logo, header, colors, and background. On the other hand, it allows you to create the sticky post, featured images and custom theme options. Overall, it’s not so bad as a new theme. 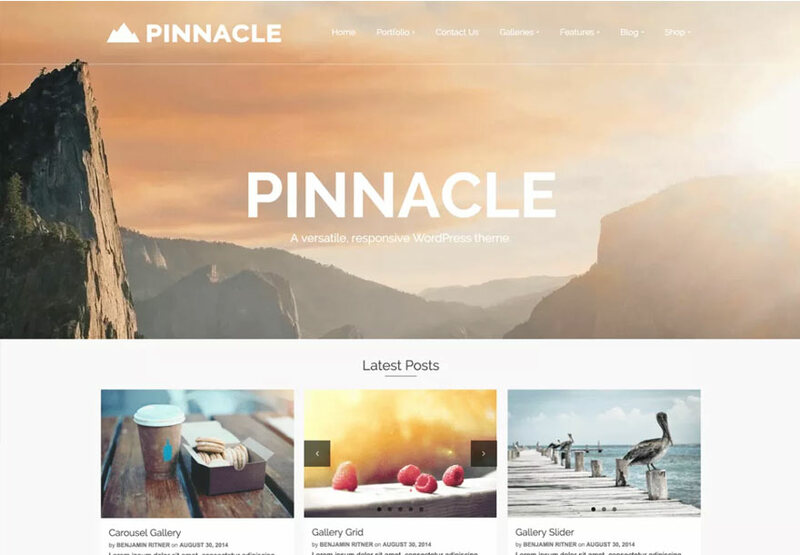 Pinnacle is a multipurpose WordPress theme and it is very familiar as the bold theme with multiple colors and options. It is considered as one of the best free WordPress theme in 2017. It has loaded some premium features and tools. For this reason, it’s so easy to make a unique layout by using this theme. Important to realize, it’s a fully responsive theme. So, you have no need to make it mobile or tablet friendly. 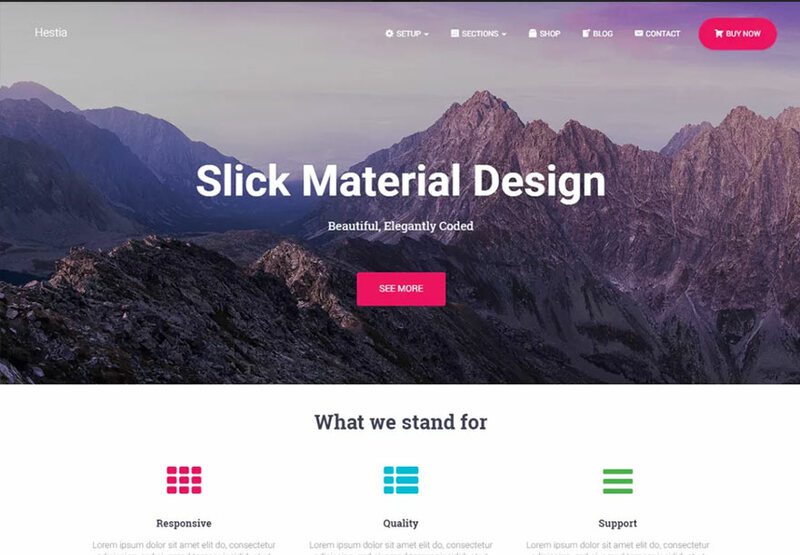 The theme will be fully compatible with WooCommerce and it will be the best suited for any kind of business, online store, portfolio, or personal site. 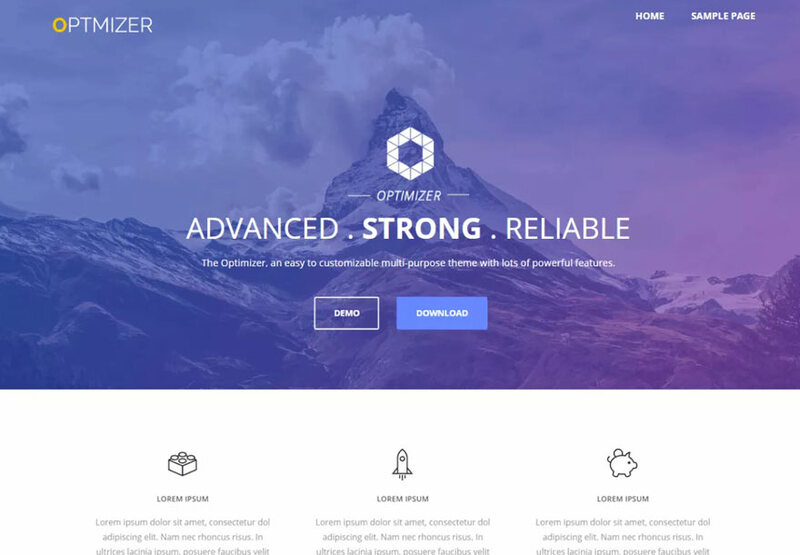 Optimizer is very popular for its powerful functionality. If allows you to customize all the options and layout without any single change in the code. It offers two different layouts including full width & boxed. It has been updated with 600+ fonts and powerful theme options. Similarly, it will give you the opportunity to create a beautiful image slider and easy logo upload. This theme is 100% responsive with custom CSS and color fields. Another key point, it has added WooCommerce for e-commerce service, MailChimp for Email subscriber area. On the other hand, it will provide you plugins bbPress for forum and contact form 7 for contact support. It is very much functional and well-optimized theme for any types of business. 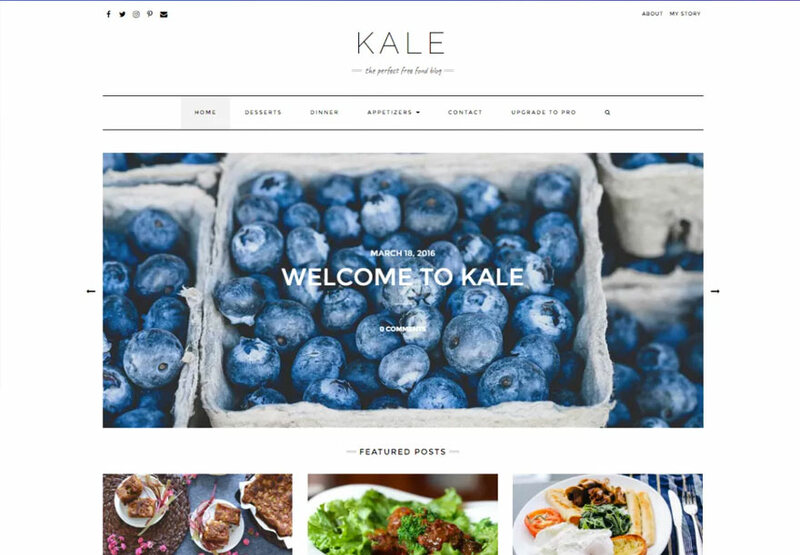 Kale is a charming free WordPress theme and it can easily be used for any type of food blog. Similarly, you can use it for various purposes. 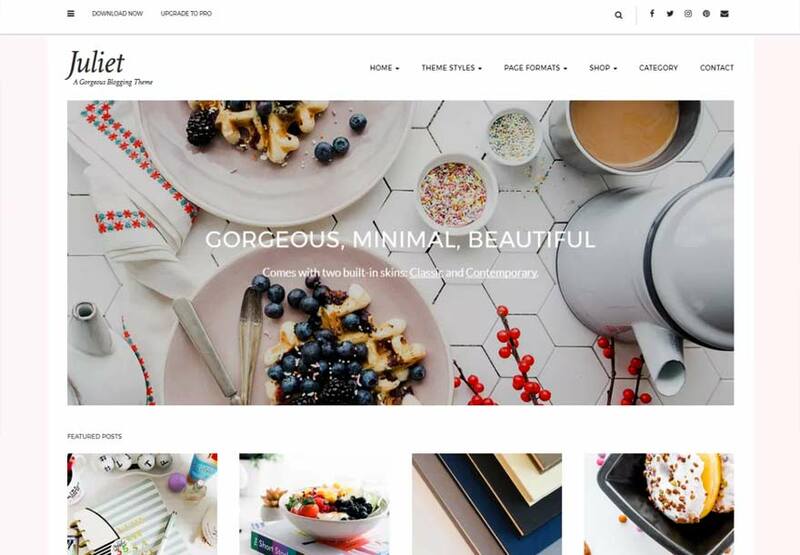 If you are planning to launch a food, cooking, recipe or fashion blog you can easily use this theme. Important to realize, it will be so perfect for parenting or lifestyle blog. The theme is WooCommerce ready, super SEO friendly as well as extremely clean. Another key point, it has added amazing social media icons to make your social presence very easy. Kale has included multiple blog layout. On the other hand, you can use your custom logo and header image with it. 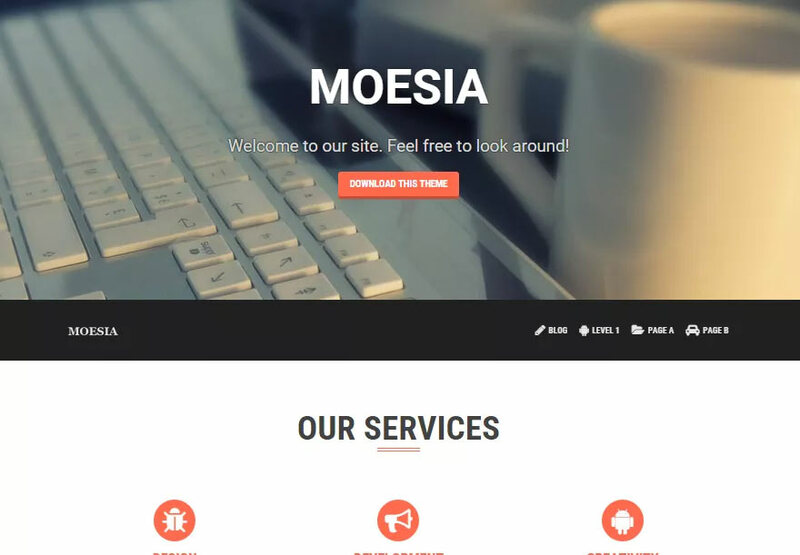 Moesia is one of the best free WordPress theme in 2017. It offers predefined 11 blocks and it will help you to build your home page with your wish. Every block will present the special background to make it more stunning. Moesia will also allow you to choose awesome Google fonts from the list. 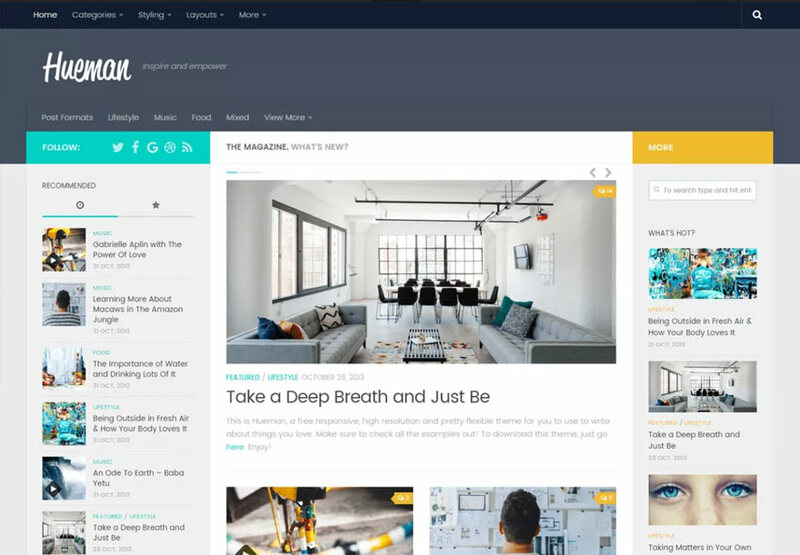 The free theme will allow you two types of blog layouts. On the other hand, it will work for using special animations and effects. Similarly, the theme will allow you to add the sticky post, custom background, logo, and header also. 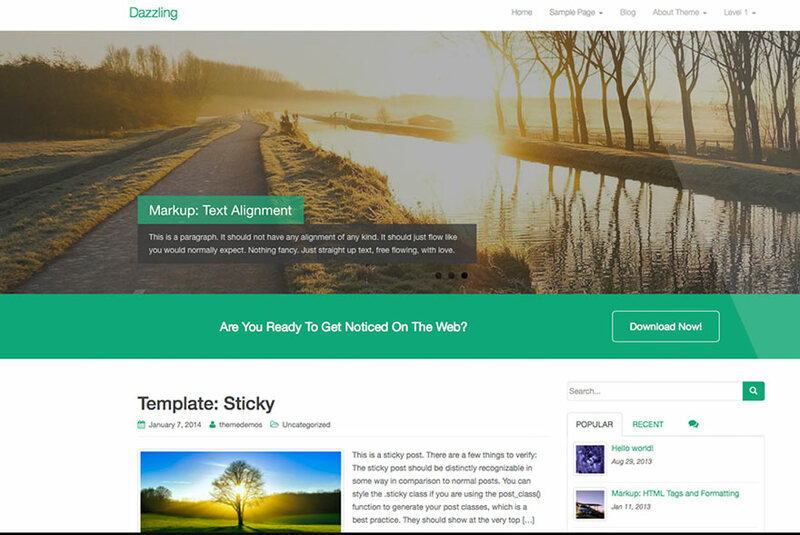 Dazzling is a free WordPress WooCommerce theme which is clean and 100% fully responsive. The theme is the best suited for static and e-commerce or business websites. It can be easily used for travel, corporate, portfolio, photography, green thinking, nature, health, personal and much more. It offers several widget areas and “call to action” button. It has been built with Bootstrap 3.0 and it allows you to upload the custom logo, background and header image. The theme is always translation ready with infinite scroll. Similarly, it offers SEO friendly structure. Really, it is one the best free WordPress theme in 2017 for eStores and business websites. 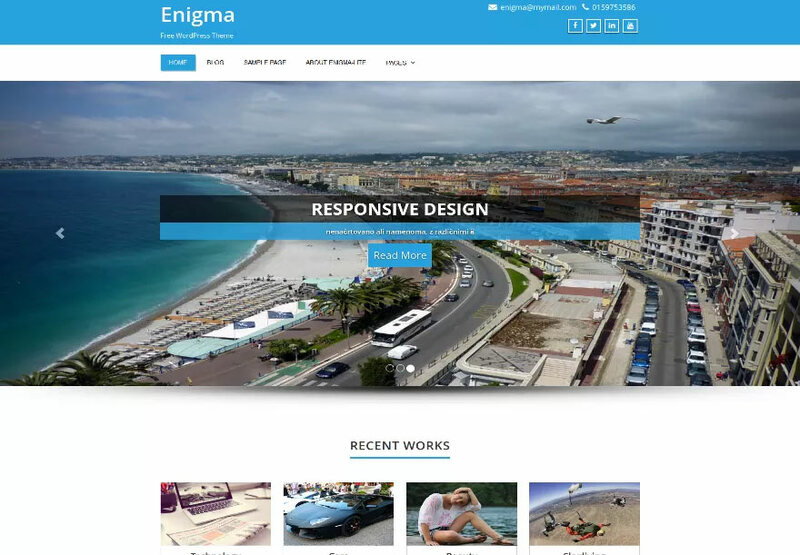 Enigma is a multipurpose WordPress theme with custom logo, background and header image. It has been built with Bootstrap 3.0 and CSS framework. Similarly, the theme is WooCommerce ready and 100% fully responsive. Important to realize, the theme offers freely 4 page and 2 post layouts. Similarly, it has different 5 widgets area and Flickr photos area to show photos from your Flickr account. The theme allows you to add social media links from amazing social media icons. The theme is translation ready and offers different colors layouts too. 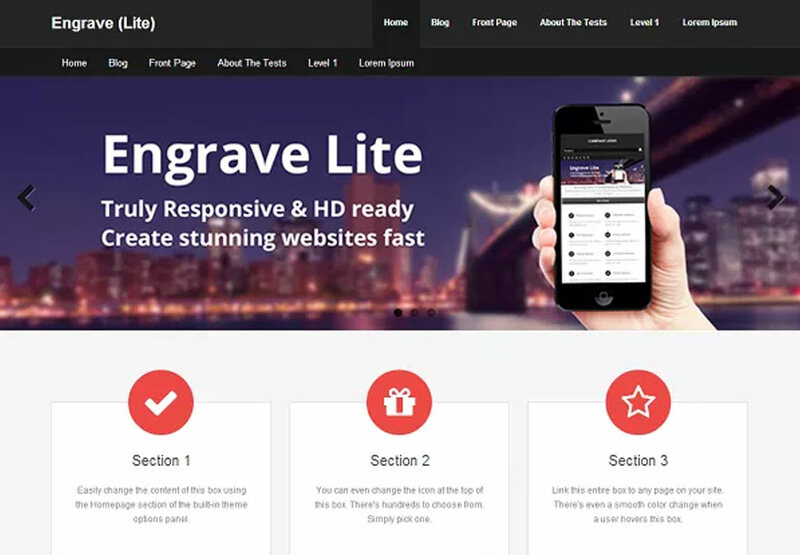 Engrave Lite is the best free WordPress theme in 2017 with awesome business and blog layout. It offers responsive layout and powerful theme options. You don’t need to change any code for customizing the theme. The theme has added “easy to build home page” options to create an amazing homepage. It has also included a stunning full-width slider. It offers to make the sticky post and fixed menus as well. Hestia is a professional modern WordPress theme and it will be the best suited for creative and small businesses. You can also use it for start-ups, online agencies, and e-commerce websites. Similarly, it will be fit for portfolios, creative business, and freelancers. Basically, it’s a multi purpose one-page design WordPress theme. Similarly, it has added Photo Gallery, Travel Map, and Flat Parallax Slider. 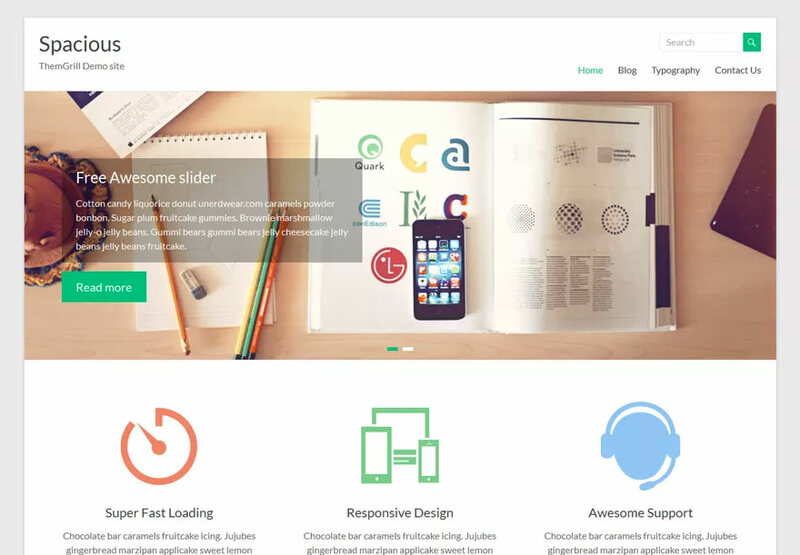 Not to mention, you will get Elementor Page Builder with this amazing free theme. Notably, the theme is a full-width template. Hueman is free magazine style free WordPress theme. It is very lightweight and fast theme. Expressively, the theme is fully responsive. You have no tension to use it on the different sizes of devices. This is the best rated free theme for Magazine and blog styles. On the other hand, it is still 80k+ active installed and 550+ 5* feedback. It is a full-width template and it supports custom logo, header image, and background. Similarly, it will also support sticky post and flexible header. 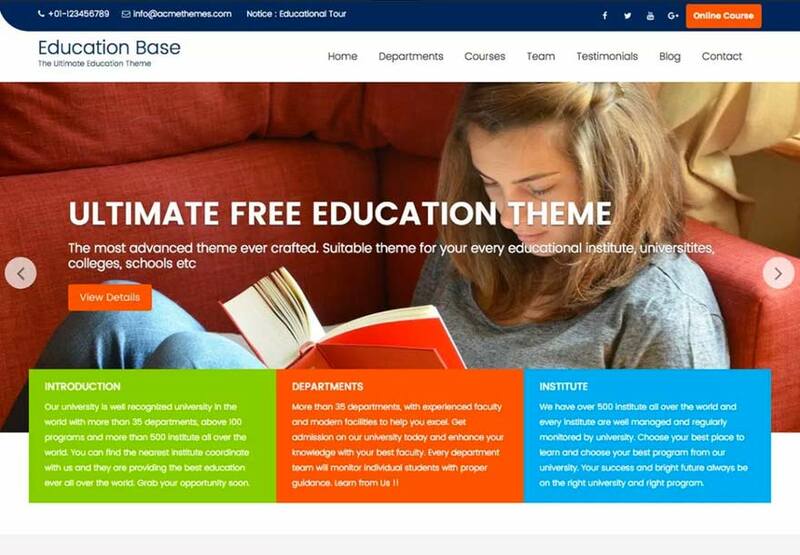 Education base is one the best free WordPress theme in 2017. The theme is very easy to use, attractive and modern too. The theme has been built considering education purposes. Any educational institution including universities, colleges, schools, and others can easily use this website for any purposes. The theme has admission area and Noticeboard which will be very helpful for any non-coder. Similarly, it allows adding custom footer text and different color, background, and logos. Markedly, it very functional and user-friendly WordPress educational websites. Juliet is a free blogging style WordPress theme and Especially, it is a very good lifestyle blog. The theme is very simple, elegant and clean. The theme is WooCommerce ready and well-organised. It offers a featured post and custom banner options in the home page. It has integrated all types of popular social media links and icons. Similarly, it offers custom sidebar, logo, and background. You can easily build an awesome e-commerce store by Juliet. 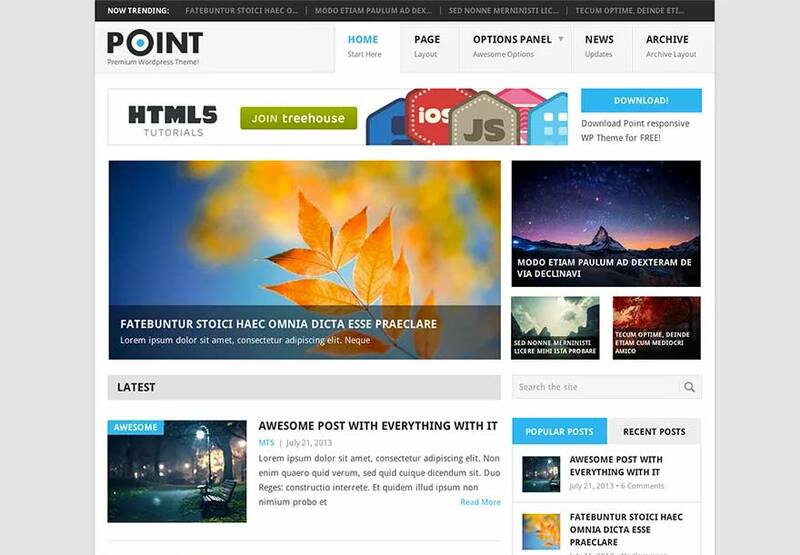 Point is very popular, responsive Multipurpose and the best free WordPress theme in 2017. Basically, It’s a magazine style WordPress theme. Though it’s very simple and user-friendly. It supports features post with slider options. On the other hand, it offers the full-width menu with drop down options. Similarly, it allows you to create popular post area in the sidebar. Significantly, it allows featured image for every post. The theme is well coded and updated regularly. This is all for today. But I will tell, if you want to use the best free WordPress theme in 2017, you can easily consider my list. I have collected this list by researching a lot of places. Similarly. I have used many of them for personal purposes. If you think you need fully customer support and stunning web page, then you can choose one from this list, which I have included for you only. If you get this article helpful for you, share it on your favorite social media. If needs any further assistance, you can contact me by the comment section. Thanks in advance.